I’ve never really gotten into the idea of New Year’s Day as a holiday. Sure, it’s as good a time as any to reflect on the recent past and look forward but so are days, weeks, months and seasons. For the overwhelming majority, all of these pass without even minor consideration. I’m not opposed. I just don’t get the idea or get into the idea the way a lot of people do. It seems a little arbitrary to pick a unit of measurement and mark it as an occasion. That said, I’m usually up past 12 on any given night and if I’m anywhere near a glass of scotch while somebody’s celebrating something — I’m happy to raise a glass. It stands to reason that I don’t really make New Year’s resolutions. They, like most human conventions, are made to be broken and tend to mean little even when successful. Let’s face it — there are better ways to spend an entire year than trying to lose 10 vanity pounds and most resolutions are just a holiday approved way of saying, “…but this time I really mean it,” about things people were already trying to do all along. Managing money better, fighting with the family less, finishing a forgotten project — what happens to make us drop the ball by the end of the month? We probably stop because it stops being important. I just don’t think the one year marker is the most tangible or realistic motivator toward moving forward. I think of more real and organic moments on which I might hang a marker and commit to change — the kind of subtler moments that pass without fanfare, the kind toward which there isn’t a countdown. One such moment was on the morning of Christmas Eve last year. I got an email about Ray Sandford’s battle to stop his own forced electroshock (ECT). The day before, he lost at the hearing he had fought so hard for — a hearing which should have restored his rights. It didn’t. Ray had hoped the coming holiday would delay his forced shock for the week. It didn’t. His shock was to be carried out on schedule, December 24th. Knowing his memory and sense would be so rocked by the ECT that he wouldn’t be able to share the holiday with family, he had tacos with his aunt the night of the hearing to celebrate Christmas. I read that email just before heading out to get some food to take to various family events. I had two or three houses to go to that day and somewhere in Minnesota, Ray was perhaps already being escorted from his home for an electrically induced seizure — knowing his Christmas festivities consisted of tacos and a hearing that turned out to be a charade. In one moment, while driving alone, I committed myself to doing whatever I could from that day forward to help bring Ray’s forced “treatments” to an end. It took almost a year, but Ray won his fight. He and everyone who took action in support of him have reason to celebrate. I was only one small voice in the crowd but as it turns out, it was public pressure that caused the psychiatrist who ordered the forced ECT to remove himself from the case. Ray got a new doctor opposed to forced shock and a new guardian. It worked because Ray spoke up and kept speaking up and because other people joined in — calling and emailing the appropriate agencies, informing the media, protesting, letting the local politicians know where they stand. It worked because people committed to action and stuck with it. It doesn’t matter what number is attached to the year but maybe it does make sense to break time up into manageable chunks. Maybe we can take a little time and consider how much change we can achieve in the course of a year. Use a reasonable amount of time and consider real and achievable action. Look into current and proposed assisted (forced) outpatient treatment laws in your state. Find individual instances in which someone needs a voice or a number of voices behind them and offer yours. Look for an instance in which complacency on our part separates someone else from their basic human rights. These problems are not in short supply. Speak up, create something, destroy something, do something that matters this year, this month, this week, even today. Submit a comment to the FDA (here or here) insisting that ECT be tested for safety and efficacy in the one week remaining. Sometimes there is a countdown. I didn’t make it, I didn’t pay anything for it and it’s not particularly happy all the way through but it is as real, endearing and oddly warming as clay can be and worth your twenty-two minutes. I’ve watched it plenty and was just given a copy on dvd after watching it online all this time. I thought it worth sharing. Thanks, Ruth! One quick painting before the festivities. Sometimes, for all the ugliness in the world, it doesn’t hurt to make a pretty picture just to make it. 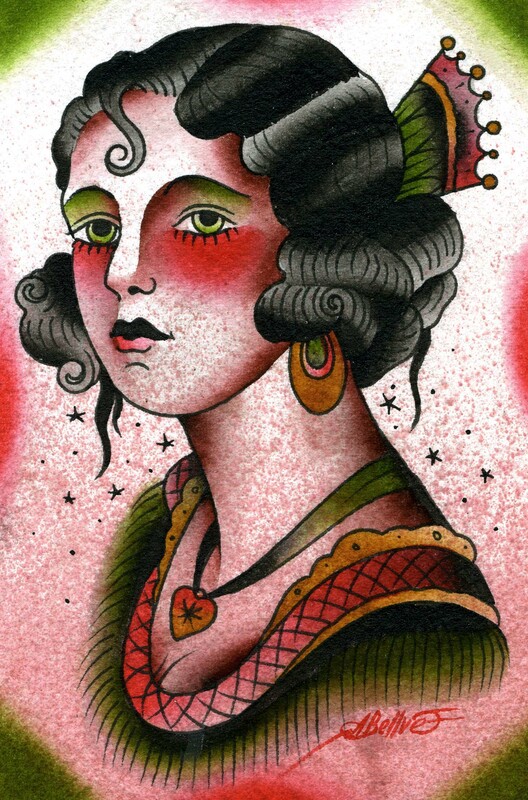 This is a smaller painting at 4 x 6″ made for a friend to give to a friend. …is for you to comment to the FDA and ask that they do their job and test shock treatment (ECT) devices. It doesn’t matter how you feel about human rights, mental illness, recovery, psychiatry — any of it. All that matters is that the FDA has an obligation to test a medical device, especially one that is used involuntarily on our citizens, for safety and efficacy. It really is that simple. ECT is no gentle process. They are inducing grand mal siezures with electricity. Does that sound safe and effective to you? Please comment in the 16 days we have left. The Food and Drug Administration is in charge of regulating medical devices just as it does drugs, including the machines used to give Electroshock. But it’s not doing its job. It has allowed these machines to be used on millions of patients over the past generation without requiring any evidence whatsoever that shock treatment is safe or effective! This is so even though shock machines are Class III -high risk — devices, which by law are supposed to be investigated by clinical trials as thoroughly as new drugs and devices just coming onto the market. But because of intense lobbying by the American Psychiatric Association — which claims the devices are safe but opposes an investigation — the FDA has disregarded its own law. You can make comments in writing to Food and Drug Administration, Dockets Management Branch (HFA-305), 5630 Fishers Lane, Room 1061, Rockville, MD 20852. The undersigned opposes the reclassification of the ECT device to Class II by the FDA in the absence of adequate scientific evidence of its safety, and asks the agency to call for PreMarket Approval Applications for the device. Also, The Opal Project has made it incredibly easy by allowing you to comment directly on their page which will then forward your comment to the FDA. It takes moments. It’s as easy as typing your name, address, email and opinion. Click here to comment via The Opal Project. I had not heard the horrible story of Chris Muth’s 2008 psychiatric incarceration and forced drugging until reading of it on the blog Lunatic Fringe. The whole thing underscores the fact that the difference between sane and insane can be a simple matter of whether the right people believe you. 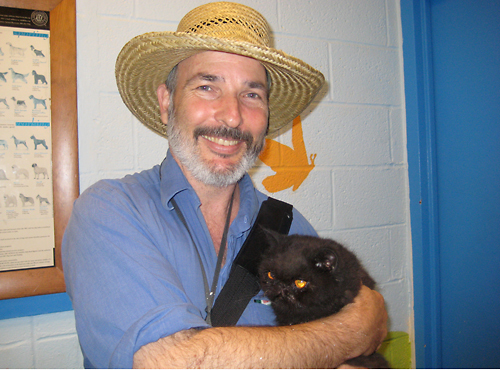 In July of 2008, Chris Muth was visited by a guest and his cat, Rumi. At some point, Rumi was poking around Muth’s apartment and entered a small hole in the bathroom wall. Muth ripped the wall open in hopes of rescuing a trapped Rumi, who returned his cat-calls, to no avail. As it turns out, the small hole led to a large drop and Rumi fell 30 feet down a shaft within the wall. In his attempts to rescue the cat, he did break into an unoccupied apartment to create an opening. Understandably, the authorities were called. What is not so easy to understand is the leap the officers made next. In typical haul-them-in-and-label-them fashion, Muth’s medical records state that he “has the bizarre delusion [that he] was trying to ‘save’ a cat of his friend.” I wonder what kind of tests they administered to determine the existence of Rumi the cat. Surely they didn’t just take the officers’ word. Right? Muth, having had enough, decided to speak up saying to the resident nurse on duty, “‘Give me a pencil and paper. I’m going to write a press release and you are going to be the laughingstock of New York.” Apparently no one informed him that the right to free speech doesn’t apply to psych patients any more than the right to due process. She did not get him a pencil and paper. She chose instead to call for orderlies who held him down while she injected him with Haldol, a particularly ugly and powerful drug from the old round of antipsychotics — a blatantly punitive chemical assault and not an attempt at anything even resembling health, treatment or care. “How can you stand up for yourself in this culture? You can punch someone and get arrested, or you can sue,” Muth said. And he’s doing just that — suing the hospital and 11 0f its employees for a total of $260, 000. Considering what he’s been through and what was taken from him, that doesn’t seem like much. I hope he gets something that he can call justice out of the ordeal. There you have it. A man carted off by the police to a psych ward, denied his basic human rights and civil liberties, separated from his freedom, his home and his source of income, held down and drugged by force — all because the police didn’t think the cat was real. And what if it hadn’t been? Would any of this be acceptable if it had all been a delusion? That’s not a rhetorical question. We need to seriously question what constitutes an abusive system, which rights we can do without and what it takes to trade them in. The mental health system has acted as a system of punishment for people on the margins of society for far too long. If Chris Muth can find himself in this situation, what misunderstanding or perception can put you there? Rumi was eventually rescued by an animal control officer and is doing well after 15 days behind the wall. Here is an article about the original event and one about the subsequent lawsuit, both from The Brooklyn Paper. Having successfully navigated his way to Oprah, Michael Schofield has now predictably gotten his book deal. It will be titled, January First: One Child’s Battle with Schizophrenia. In addition , 20/20 is rumored to be covering the story. Given the even handed way ABC addressed mental illness last time and the fact that Michael has had a good chance to whittle down the “facts,” it should prove to be that perfect blend of misinformation and fluff we’ve come to expect from major corporate media. On Michael’s new blog, he makes a good attempt at backpedaling regarding Jani’s abuse. Most of the attacks against me have come as a result of me being overly dramatic in my writing (the “starving” and “hitting her as hard as we could” are the two most egregious examples). Such writing is unfortunately a legacy of my training as a writer, which occurred long before Jani, as well as my own tendencies developed from my favorite writers over the years. Such writing captures the emotions of what I feel, or in those cases felt (powerless to affect any change in Jani’s behavior) but is not appropriate in cases such as this where no drama is necessary. I don’t intentionally try to pump up the story. I am just writing what I feel, and what I feel is often worse than the real situation. It is has been a hard habit to break and I am still working on it. And what a legacy it is. I find it interesting how pliable a thing “truth” is to him. If you can claim to have abused your child for dramatic effect, couldn’t you even more easily deny it for the sake of appearance? Maybe the truth is something no one will know outside of the family but what seems painfully obvious is that in either case, it’s secondary to selling a story. It really seems as though he grooms the story to suit his audience and it makes me wonder what other grooming is going on — which brings me to the next creepy turn of events. The Schofields have enlisted the services of Steve Truitt — a talent coach, media trainer, life coach and hypnotherapist. I think if one were to write a book about a child’s emotional state being exploited in a situation where truth is already a hazy commodity, the talent coach/hypnotherapist would probably be introduced some time around chapter three and the outcome would be predictably bad simply by his being there. That’s fine for a novel but we’re talking about a life story. A more glaring and potentially damaging conflict of interest might be hard to find, lending itself all to well to a child being groomed in the interest of personal gain and it all makes me wonder what’s more important here — Jani’s health or Jani’s story? In fairness, I don’t know to what extent or in what capacity Truitt is working for them as he’s simply listed on their website as Media: Steve Truitt but it’s a frightening addition to an already volatile mix. Bitter Pill to Swallow? Try the Shot. Facing the impending expiration of its bestseller Zyprexa’s patent, Eli Lily has just introduced their newly approved Zyprexa Relprevv, a long acting injectable, for use in adults diagnosed with schizophrenia. While it may be good business, it may prove for many to be bad medicine. If a classic pharma strategy holds true, the drug may also extend Lilly’s ability to make money from its Zyprexa franchise. The company is likely to face generic competition on regular-selling Zyprexa in 2011. But a key patent on the extended release version of the drug is valid until 2018, a Lilly spokeswoman told the Health Blog. Drug makers have long brought out extended-release versions of drugs (often branded XR or CR) as a way to fight generic competition. Antipsychotics were the top-selling class of drugsin the U.S. last year, and they’re losing patent protection left and right these days. Drug makers are bringing out extend-release versions of several drugs in the class, including AstraZeneca’sSeroquel XR and Johnson and Johnson’s Risperdal Consta. For the new version, patients will visit their doctors every two or four weeks — depending on their dosage — to receive the injection, spokeswoman Janell Smith said. She said the longer-lasting version makes it easier for patients to stay on the medication, and it allows doctors to track whether they’re doing that since they have to make office visits for the injections. Given the list of risks and side effects, I wouldn’t say it makes it easy for patients but it does make it easy for their doctors to monitor and carry out their drug regimen. This effectively clears the hurdle of a person’s choice to discontinue the drug if, for example, the side effects prove too brutal or they choose another path toward their own wellness. While force isn’t the only intended purpose for this drug, you’ll find it’s the perfect companion (from the pro-drug and pro-force perspective) to the growing national trend toward forced outpatient treatment, more kindly termed by its proponents in government and industry as “assisted” outpatient treatment. A term not unlike calling solitary confinement assisted “me time.” AOT laws are currently in place in most states and are in the works in many of the remaining few. This new injectable appears to be the first of its class approved for “acute agitation” a point laid out in this little fear-blurb from The Medical News. Acute agitation is a well-recognized behavioral syndrome with a range of symptoms, including hostility, extreme excitement, poor impulse control, tension and uncooperativeness. The syndrome can occur with a number of conditions, including schizophrenia and bipolar disorder. Patients suffering from agitation in its severe forms are usually in an emergency situation and require immediate treatment to alleviate personal distress and to prevent harm to themselves and others. “Well-recognized” just means “medically baseless but agreed upon” and their idea of agitation is a clear case of pathologizing human behavior. The “symptoms” of acute agitation are just a list of how any person might respond to forced treatment and incarceration. Unfortunately, our system is so tilted in the medical establishment’s favor that once it’s called a disease, a disorder or a syndrome, all bets are off and it can be treated with drugs and your consent is irrelevant. Disease debate aside, approving a long acting injectable for episodic behavior is a bold step toward an increasingly blatant use of drugs as control. No one should be on a month’s worth of drugs for a day’s worth of being hostile and uncooperative, regardless of the cause. Interestingly but not surprisingly — US News directs readers not to Eli Lily for more information on the drug but to NAMI. That’s some clever positioning for a “grassroots” patients’ advocacy group. They are looking more like a drug makers’ advocacy group every day. abellve on Are You S.I.C.K. ?